#UpperGooseLakeFire | Washington | Breaking! 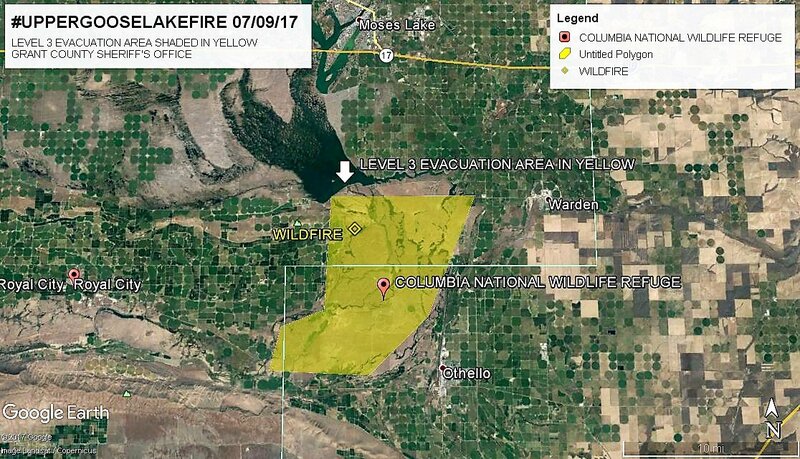 Incident Summary | A wildfire is burning in the Upper Goose Lake recreation area that is adjacent to the Columbia National Wildlife Reservoir, located in Moses Lake and North of Othello, Washington. Size Up | Unknown fire size and has been stated to be a huge fire. Conditions | Firefighters will be faced with the area’s landscapes peppered with rugged cliffs, canyons, lakes, and sagebrush grasslands. Office around 1630 hours PDT, to leave immediately. This order pertains to only people inside the Recreation area. The Sheriff’s Office stated there is no danger to homes on the outside of the area. Fire Weather | The current weather report as of 1720 hours are temps of 93*F, RH of 13% and winds out of the W-SW 13 mph. There is currently a RED FLAG WARNING until 2100 hours on Sunday, July 9, 2017. The area has 130.4 acres of lake and is at an elevation of 865 feet. This area is popular for camping, fishing and other outdoor activities.